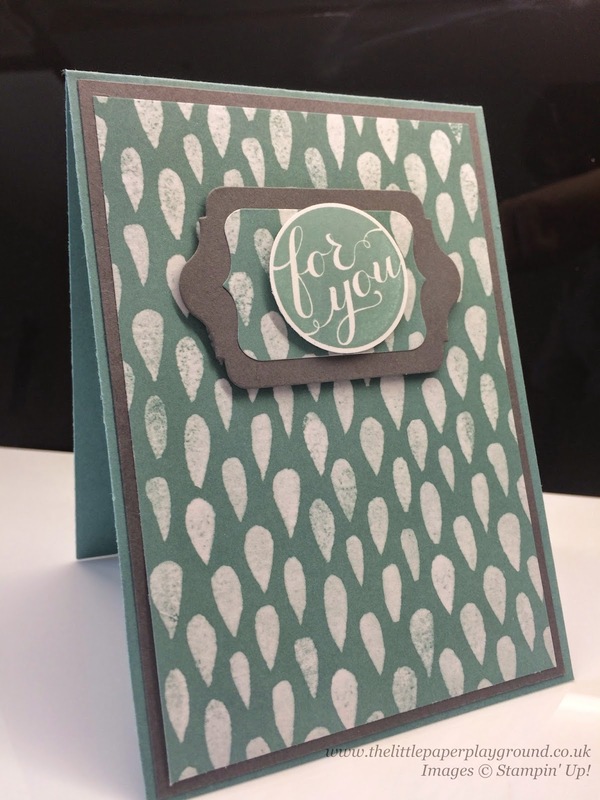 As someone who has very shaky hands, until I found Stampin' Up! I always struggled cutting shapes and stamping images anywhere near straight. My Big Shot and punches are my new best friends and now do all the fiddly work for me! Today's project came about as I wanted to make something for my line manager's little boy to say well done for getting an award for behaviour and attendance during his first year at school. 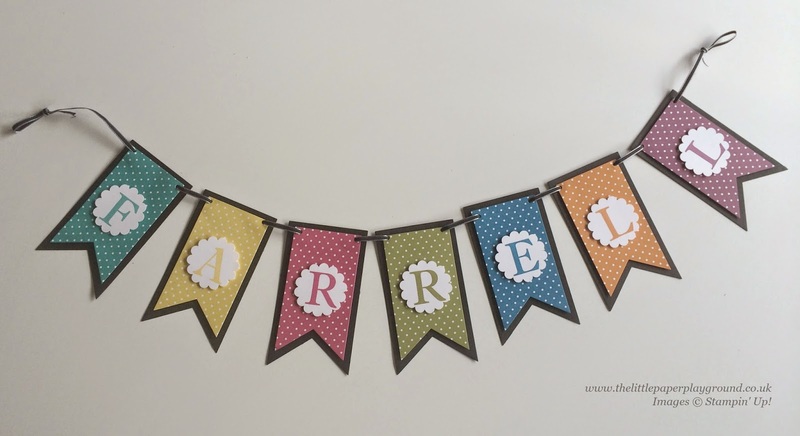 My son's room has a circus theme adorned with polka dot bunting so that inspired this brightly coloured and dotty name banner. It might look complicated but it's quite easy, even with my shaky hands! I used the largest and second largest banner framelits for the base, adhering the brights DSP to the basic black card stock with dimensionals. Then, using the matching ink for each banner section, I used the Sophisticated Serifs stamp set to stamp each of the name letters out. A bit of scallop circle punching and adhering with dimensionals and you're almost set. The fiddly bit for me was sewing the ribbon through each banner, but I've never been much of a sewing sort, our button box is evidence of that. 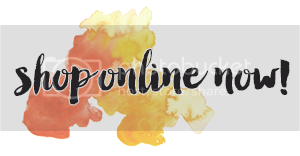 Why not have a go, I'd love to see what banner creations you come up with! As soon as I saw the main sentiment on the Hello Life stamp set I had to have it. 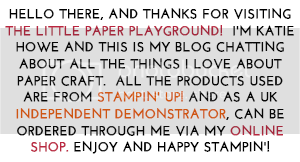 It is such a large font and bold statement, I didn't want to add any extra fuss really. 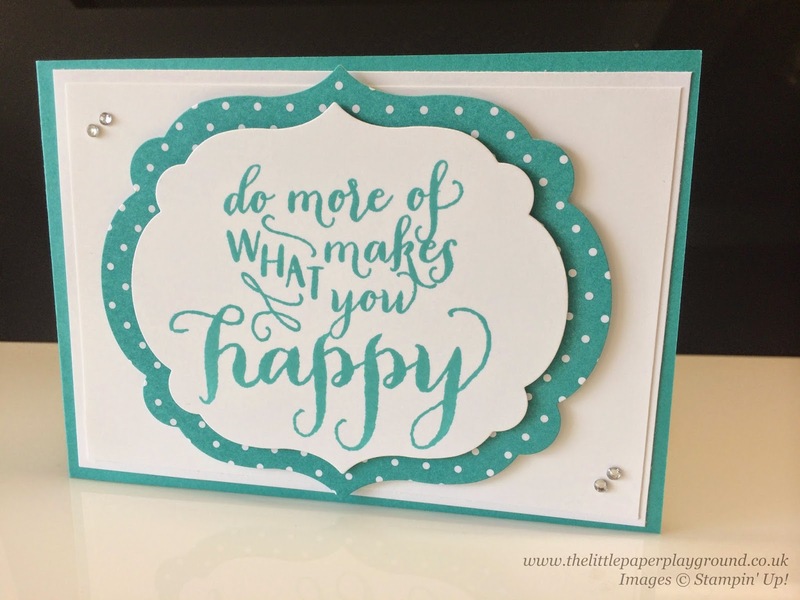 A bit of colour using the Brights Designer Series Paper Stack and layering using the Labels Framelits to make the sentiment pop and there you have it. I added some basic rhinestones as I fancied a bit of bling but you don't necessarily need them. Make one or a whole rainbow, whatever takes your fancy! 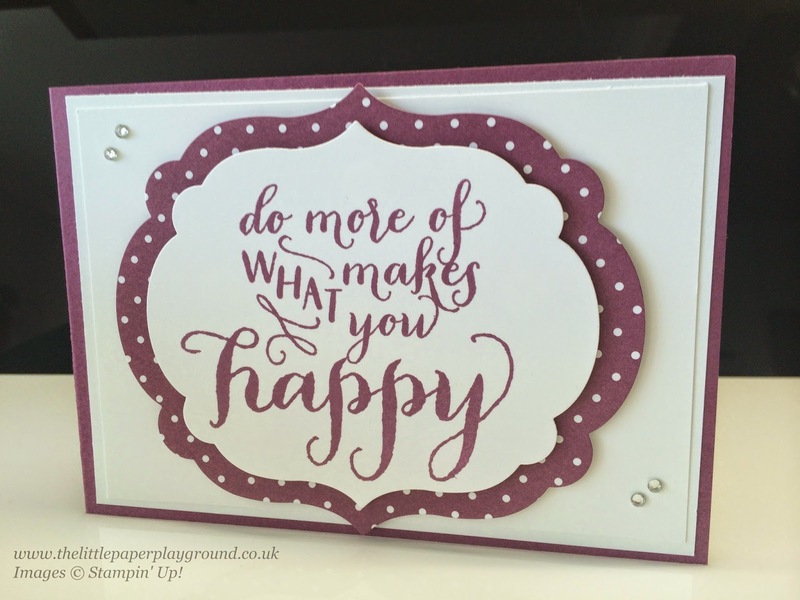 So confession time folks, this card was actually made a few weeks ago but family commitments and my day job have meant crafting and blogging have been hit hard *sad face*. So here we are, an any occasion note card. Slightly manly I guess but I don't mind that as I always find cards for male friends or relations difficult to come up with! It is using the Moonlight DSP stack which is fab as you get such a great selection of DSP to play with or gaze fondly at. 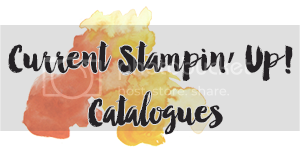 The sentiment is from the 'Hello There' stamp set which is only available to purchase with Hostess Credits which can be gained with purchases of £150 or more either from individual orders or collected if you host a party and total orders go above this point. Add a bit of laying using the Chalk Talk Framelits and a circle punch and Bob's your uncle! You could of course work your way through the DSP stack and keep the template the same and just alternate the colours. Quick and easy whenever you need one!